Deirdre Hynds from Westmeath and Pay McIntyre from Offaly met for the first time at the student bar at UCD. Then the second time they met for the first time was at a local nightclub in Moate (Pat doesn't remember meeting Deirdre at college, she says). 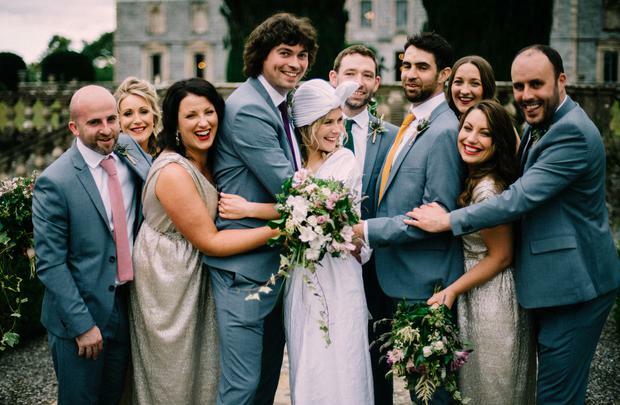 The couple had a less-than-traditional engagement, with Deirdre popping the question in the early hours of the morning in a tent at Body and Soul festival. 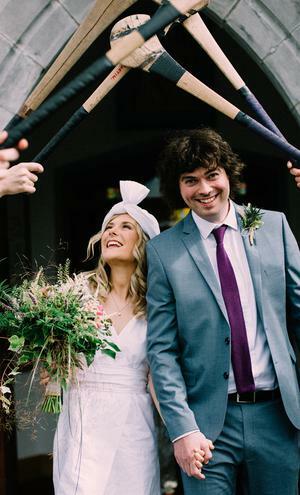 They wanted a relaxed and unfussy wedding, and tied the knot just three months after deciding to get married. Because they had such a short window of time to plan, Deirdre says they enjoyed pulling the day together. "It didn’t take over our lives, but didn’t get tedious or boring. There were a few stressful moments though…but nothing too bad!" 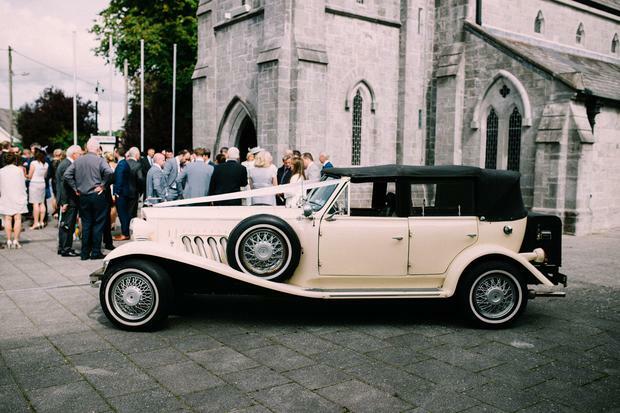 They exchanged vows in the Carmelite Church in Moate, in a 'straightforward' ceremony by their good friend Fr. Brian Starken, before heading to the then only newly renovated Gloster House in Offaly for food and drinks. In 2016, Gloster House was somewhat different to how it appears today - the on site chapel (where Deirdre, Pat and guests spent the evening), was painted in a moss green in one room, and burnt orange through to another. It's now painted a brilliant white, is beaming with natural light, and is used for on-site ceremonies. 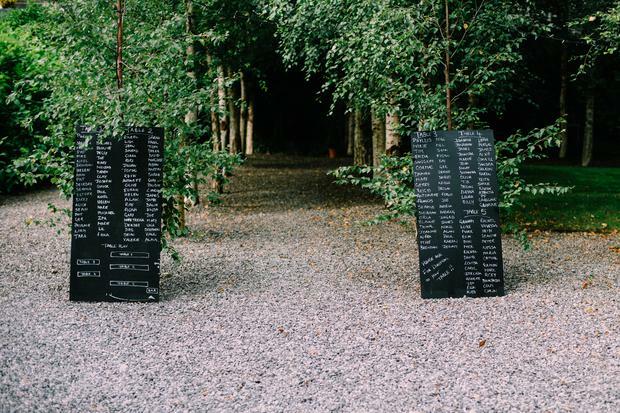 "They weren’t really open for bookings until the following year," explains Deirdre. "But when they brought us on a tour around the grounds and the house, it was clear attention had been meticulously paid to every detail. "Funnily enough the space we fell in love with was the old chapel on the grounds, which was being used as a storage space. It wasn’t in the best of shape, and wasn’t technically part of the venue space for hire, but we really pushed for it!" Controversially too, the couple didn't want their guests to spend the evening on their feet, "in fact we actively discouraged people not to dance by taking the emphasis off the dance floor," Deirdre notes, so they went without a wedding band and instead set out sharing platters at tables so that guests were happy sitting around and chatting over a couple of glasses of wine. 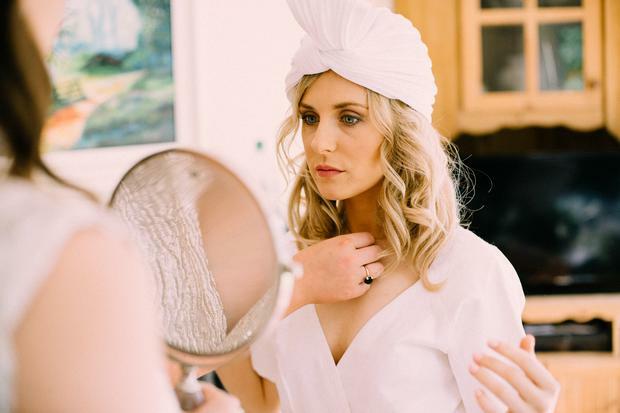 Of course Deirdre's wedding dress and turban is one of the most eye-catching elements of the wedding and, as a founding member of ecolux Irish fashion brand We are Islanders, she was was sufficiently connected to have the label's chief designer Rosie O'Reilly create her bridal gown. Deirdre's turban was designed especially for her by award-winning milliner Laura Kinsella. Pat and Deirdre's wedding photos are by Berit Altis. 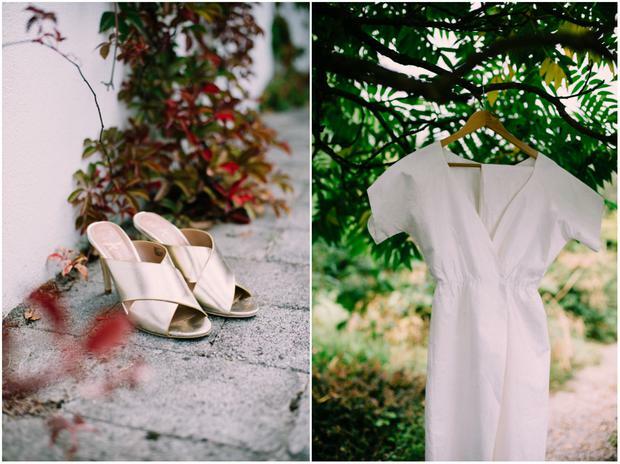 Together with Rosie O'Reilly and Kate Nolan, Deirdre was a founding member of the ethical and sustainable fashion and accessories label, We are Islanders, and so it made sense for her to have her wedding dress designed by fellow founder Rosie, using materials and techniques used throughout the label's own collections. The dress was made from Irish linen - sourced in Derry - using a process known as 'beetling', whereby the linen is hammered until it become almost rigid. "it almost stood up on its on when not being worn," says Deirdre. 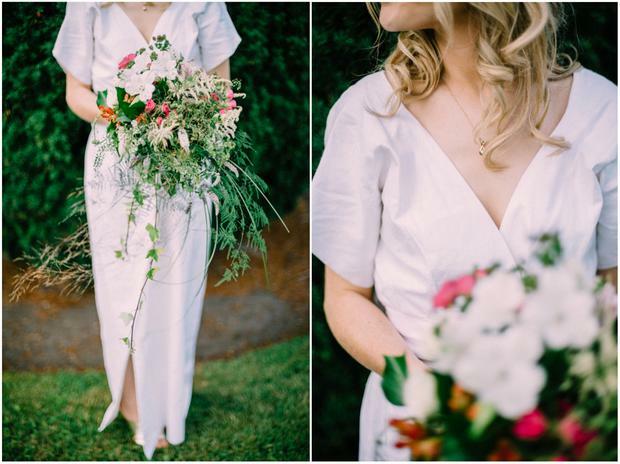 "To be honest," says Deidre, "I just wanted to wear a long white shirt-dress, simple and functional, and light and easy to move in, so the style of the dress was based on that. I am also quite small, so we went for a heavy belted waist for definition - I didn’t want any embellishment of any description." 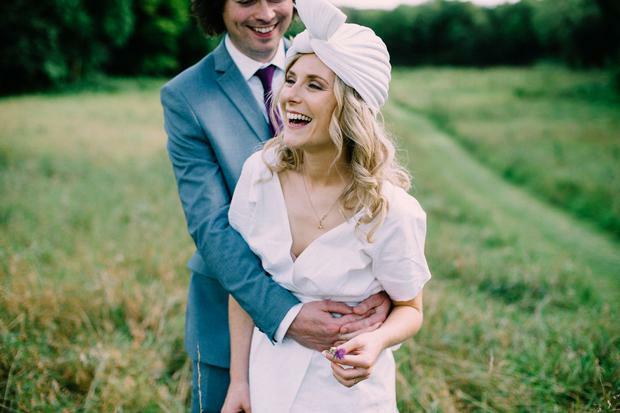 Deirdre's turban was produced in Irish linen, and designed by award winning milliner Laura Kinsella. The style was Art Deco, and was Deirdre's nod to a veil, while still supporting Irish fashion and design. Pat and his groomsmen purchased their suits from Marks and Spencer. 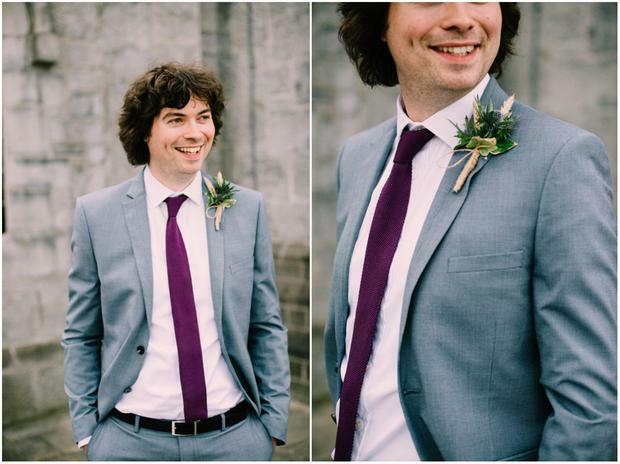 "I would safely say that the groom’s whole look got a lot more time and focus than the bride’s!" jokes Deirdre. 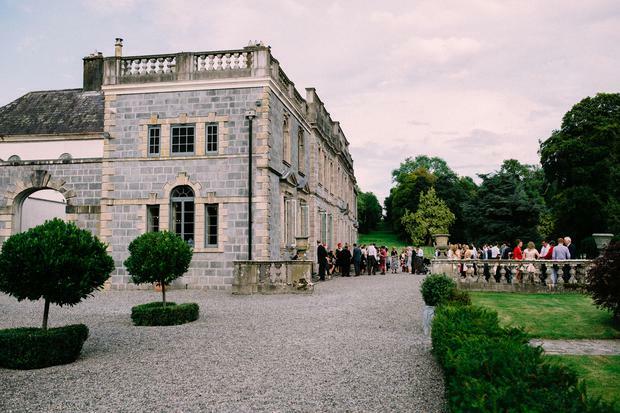 Pat and Deirdre chose Gloster House in Offaly as their reception venue, however at the time the house and its surrounding spaces weren't fully ready for the wedding industry. It didn't bother the couple however, who fell in love with the breathtaking main building, the beautifully preened gardens and a then rather shabby looking chapel across the courtyard. "It wasn’t in the best of shape," Deirdre recalls, "and wasn’t technically part of the venue space for hire, but we really pushed for it! The dimensions, lighting, and windows of the room were gorgeous, but it was full of old furniture and odds and ends. A group of our best friends travelled down from Dublin for the day, and we prepped the space, and then Tom and Mary - (Alexander) – the couple who bought it have done an amazing job restoring it - stepped in to make sure it was really guest ready, so I guess that was a bit of an unanticipated DIY project for everyone, but it was definitely worth it." The couple wanted an informal, laid-back day where guests could chat and mingle, and wanted long banqueting style tables in the room so guests could dine 'family style'. "We wanted all of the food served in a way that encouraged people to interact and share, so we had sharing platters of antipasti and big sharing dishes of hot food." They opted to forgo a wedding band, and went for a jazz quartet instead. However one of their regrets from the day is only having booked them for two hours. "We felt we were taking a risk booking the jazz band as we weren’t sure if people would enjoy it or not," Deirdre explains, "but people absolutely loved it, so I wish we had booked them for four hours, or even five! It created such a beautiful atmosphere." Gloster House is such a stunning space that very little had to be done to it on the day to make it all the more special, and the couple were keen to have things 'as natural as possible. 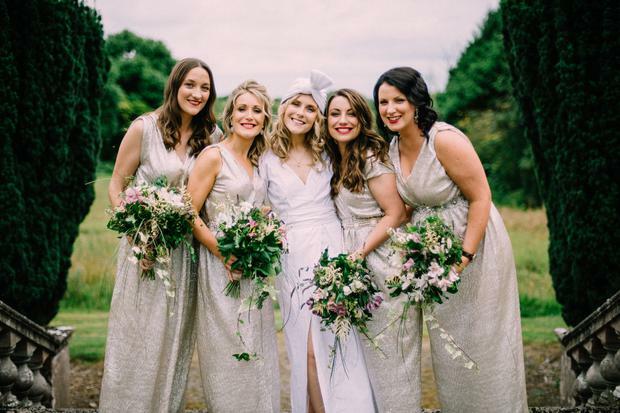 "Honeydew Events looked after our catering, but Natasha (the proprietor) also has a fantastic eye for style, and she dressed the venue with ferns and foliage she found outside on the grounds, which worked perfectly alongside some plain silver candelabras. The florist in Moate Castle Flower supplied beautiful bouquets - created by pulling as much stuff from hedgerows as possible. They had barley grass and thistles, which Deirdre adds; "looked so nice that we decided to use thistles for all of the button-holes." Guests were served Irish craft cider by Falling Apple with cheese and pork canapés at the reception, and the couple had a good selection of Irish craft beers flowing all night thanks to O’Hara’s. Honeydew Events created antipasti plates with Irish cheeses and meats to start, and for mains served up big sharing bowls of Moroccan Lamb Tagine, Dublin Bay Fish Stew, and Beef Bourguignon. "We wanted people to trial all of the dishes, and just enjoy sitting around eating and chatting for as long as possible," explains Deirdre. "My mum told me that one of her (male!) friends, ate nine servings at dinner… I was really delighted to hear that!" "We weren’t going to have speeches, but then we did, and I am glad, as they were lovely, says Deidre. 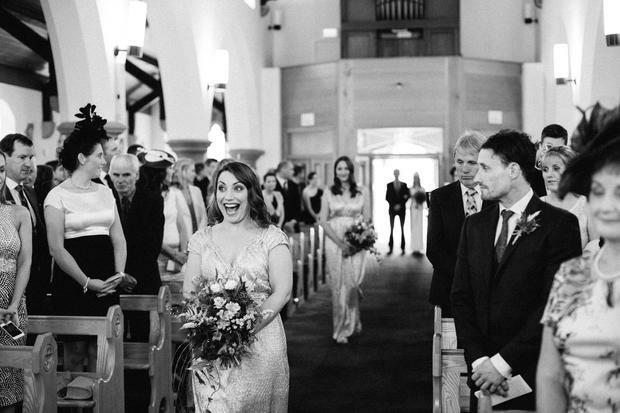 "I also really enjoyed greeting all of our guests when the ceremony was finished. 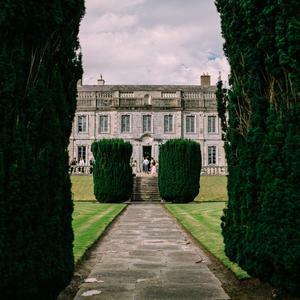 Gloster House is in Offaly so was quite local to all of our friends and family, but most of them didn’t really know that it existed. So many of them were really wowed by it, and it was lovely seeing how much they enjoyed touring the grounds and the house. Another thing was dancing to Caribou ‘Can’t do without you’ surrounded by a circle of all of our best friends... and one of the groomsmen did a terrible version of The Doors ‘The Crystal Ship’ in the latter part of the night, which was pretty funny." The couple have very few things they'd do different around the wedding. One being that they'd hire the jazz quartet for a lot longer if they could, and another involoves something entirely different; "I did my driving test and failed it two days before the wedding," says Deidre, "going back again I probably wouldn’t have done that!" 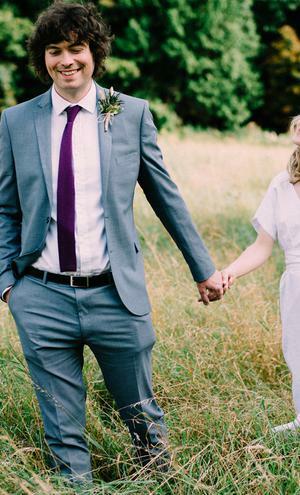 "I always tell people to look after their health in the lead up to it, and try not to do too much, or get a bit run down, as many people tend to get sick after the wedding, whether it’s just a cold or a flu," advises Deidre. 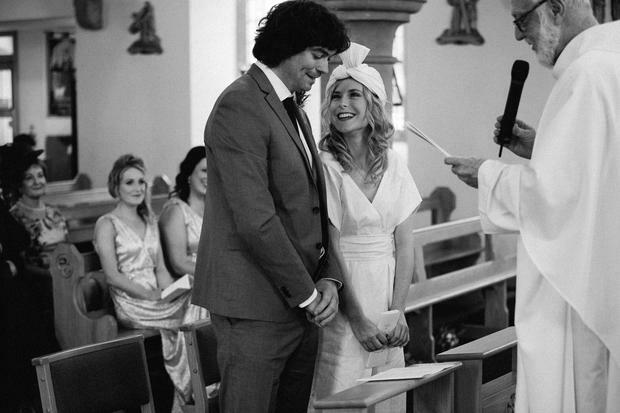 "So take loads of supplements, eat really well, get plenty of sleep, and if you can go for massages, or do whatever makes you feel relaxed, do it, and that goes for the groom as well as the bride! "Also, just lie and say that you do have everything under control when people ask." Pat and Deirdre went to the lighthouse on Clare Island, and then to Electric Picnic to meet friends for their honeymoon.